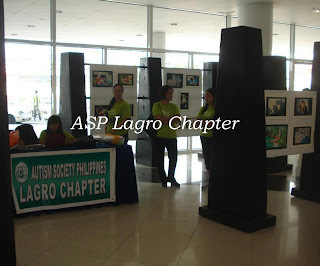 As part of the celebration of the 16th National Autism Consciousness Week, ASP Lagro Quezon City chapter showcased the artistic talents of children with autism thru a photo exhibit dubbed “Color of Autism Spectrum” from January 24 to 29, 2012 at the Atrium of SM City Fairview. The exhibit include photos taken by children with autism thru a point and shoot camera and also photos taken by volunteer photographers that captured the bonding moments of the child with autism with their father, mother or sibling. ASP Lagro Chapter President Marietta Tan with Mayette Tan and Michelle Sevilla at SM MOA. The project was conceptualized by ace photographer and autism angel John Chua with the support of Canon Philippines and SM Programs on Disability Affairs headed by Engr. Bien Mateo. Aside from the photo exhibit, the chapter also in the Sensory Friendly Movie showing last January 28 at SM City Fairview. They also participated in the Awarding and Closing Ceremony of the celebration last January 29 also at SM City Fairview. Tanya Dagundon, John Edgar Bacani, and John Paul Lumba were among the children with autism who entertained the audience during the said event. Congratulations to Marietta Tan, Ms. Robby Pagcaliwagan and the members of ASP Lagro chapter for a very active participation. Our sincerest thanks to Engr. Dennis Martel, Mr. Mathew Espina, Arch. Ruel Magat and their team for all the support! To know more of ASP Lagro Chapter's activities, you may get in touch with Ms. Marietta Tan, Chapter President at mobile no. (0918) 340-7975.